Fiat G.50, FA-21 (MM.4941), flown by Vanrikki (2nd Lieutenant) R.Sartiarvi of 1/LeLv 26, Suomen llmavoimat, Kilpasilta, March 1943. 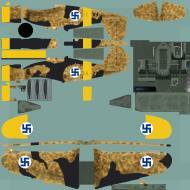 The fuselage was finished in the standard Black and Olive Green Finnish camouflage, with Light Blue undersurfaces. Wings and cowling had retained the original Italian three-tone camouflage with Dark Green and Brown mottling over Sand background. Black bands were added above the wings, probably just to match the fuselage scheme. Actually, such a mixed scheme reflected a very troubled operational career of the machine, having its wings and cowling seemingly replaced with others coming from a different plane. This aircraft, part of the CMASA-built third production series, had arrived to Finland on 3 March 1940, being assigned on 18 June to Vanrikki Kokkonen of 3/LeLv 26, who survived a crash landing at llomantsi on 15 July, when he completely run out of fuel. After repairs, it went to 2/LeLv 26 on 11 May 1942, later overturning on a forced landing at Vernitza on 30 June, while flown by Luutnantti (Lieutenant) Hamalainen who escaped unhurt. It was finally posted to 1/LeLv 26 on 17.7.42 where it overturned again on landing at Kilpasilta on 6 April 1943. 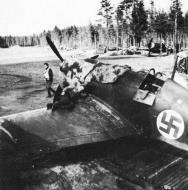 Vanrikki Helin at the controls was able to escape safely but the aircraft could no longer be repaired. Fiat G.50, FA-19 (MM.4725), flown by Vanrikki (2nd Lieutenant) O. Lansivaara, 2/LeLv 26, Suomen llmavoimat, Kilpasilta, June 1943. This aircraft shows to advantage the development of Finnish camouflage during G.50’s operational career. As the original camouflage got worn-out quite soon, in March 1942, when in force to 1/LeLv 26 and individually coded ‘blue 5’ with a blue spinner, it was painted Olive Green overall, even if the original mottled scheme still showed through. A few large black blotches were later added, resembling the black and green Finnish camouflage. The aircraft was later assigned to the second squadron, even if retaining the light blue spinner, carrying a white 9 with two horizontal bars on tail and a badge, possibly a squadron insignia, representing a sword swinging arm, as seen on some aircraft in the summer of 1943. Later it was overhauled and repainted in the standard Finnish scheme, however loosing its badge. This was another second series plane clearly fitted with the enclosed type canopy, even if later modified, and with an unbalanced rudder, possibly confirming the hypothesis of some component mix-up on Finnish machines. Previously unpublished photo of FA-31 parked on frozen Haukkajarvi lake (near Utti airfield) taken on March 13, 1940. The plane arrived to Finland on March 10 and was not used for combat operations during Winter war. Fiat G.50, FA-33 (MM.4945), flown by Lentomestari Oiva Tuominen, 2/LeLv 26, Suomen llmavoimat, Kauhava, March 1942. Three-tone camouflage scheme with Green and Brown Blotches on Sand Background and Light Grey under surfaces. 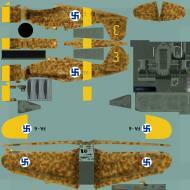 A yellow cowling band had been added since 1.9.41 as an additional theatre marking. Aircraft equipped with same skis as used on Fokker D.XXIs were operated in wintertime from snowy landing strips. Tuominen flew FA-33 early in 1942, even if this plane had been previously used by Vaapeli (Master Sergeant) Lasse Aaltonen, whose victories decorated the rudder, referring to 1.5 SB-2 bombers claimed on 25.6.41. Fitting of a non balanced rudder on this third series machine could indicate some ‘remixing’ of parts coming from different construction series, probably occurred when aircraft had been reassembled in Sweden. The large spinner - yellow for the second squadron - was designed in Sweden in order to prevent freezing of propeller pitch variation gear. 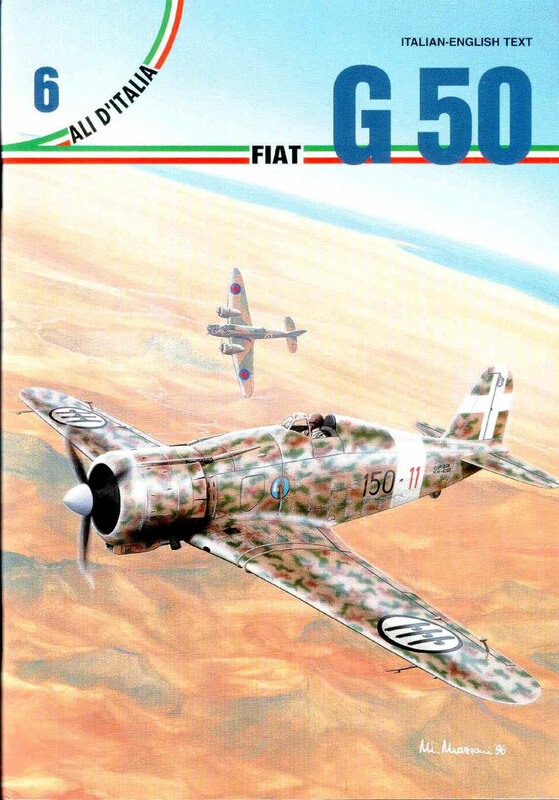 Fiat G.50 FA-4, 2nd series, serial M.M. 4722, 2/LeLv 26, August 1941, Lunkula air base, piloted by luutnantti (lieutenant) L. Hamalainen. 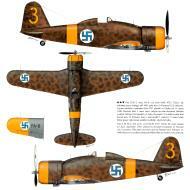 The plane arrived to Finland on February 15, 1940 and served with No 26 squadron. It was used during the final struggles of so-called Winter War against the Soviet Union. 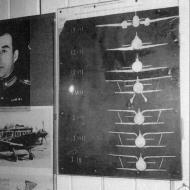 Luutnantti (lieutenant) O. Puhakka and kersantti (sergeant) L. Aaltonen achieved 3 aerial victories using FA-4. It was damaged after the war in April 1940 when kersantti (sergeant) Saarni turned it over. Photo: FA-4 of 2nd flight, 26th squadron, Lunkula air base, August, 1941, maintained by the mechanics. This plane was often flown by luutnantti Hamalainen. Fiat G.50, FA-1 (MM.4738), flown by Vanrikki L.Silvannoinen of 3/LeLv 26, Suomen llmavoimat, Kilpasilta, March 1943. Standard Dark Green and Black camouflage, with Light Blue undersurfaces. The propeller spinner, of non standard type, was probably the same fitted to Brewster Buffaloes and used on some G.50, possibly for the unavailability of the standard Swedish-built type. The first aircraft consigned to the Finnish Air Force in 1940, it was later modified with a balanced rudder and a new radio antenna mast. After having been used with the experimental unit at Tampere State Aircraft Factory, it was assigned to LeLv 26 and also flown by Puhakka on many occasions in 1941. After having overturned at least twice on landing accidents, it was always repaired till when it was withdrawn in July 1943 due to lack of spares. FA-25, August 31st, 1942, Kilpasilta. The plane was flown by luutnantti Puhakka, then the leader of 3rd flight, 26th squadron. Note the mechanic V. Nevalainen taking a rest on the wing and vanrikki N. Trontti (6 Fiat victories) walking in the background. Photo: FA-25 with a “yellow 9" on her tailplane taxiing at Malmi airfield in March, 1942. She belonged to 1st flight of 26th squadron defending Helsinki. Photo: FA-25 of 1st flight, 26th squadron, Malmi airfield, ready to defend the capital city Helsinki in January, 1942. Photo Fiat G50 Freccia FAF 3.LeLv26 FA 25 Olli Puhakka MM3614 and FA 15 Kilpasilta Dec 1942 Revi 29 Page 20. Fiat G.50 FA-25, 1st series, serial M. M. 3614, 2/LeLv 26, March 1942, piloted by luutnantti (lieutenant) O. Puhakka. This plane was used by all three flights of the squadron during summer and fall 1941 and she was damaged by kersantti (sergeant) Alakoski at Immola. The drawing shows the plane in March 1942 after the repair. The same plane in October 1942 after more repairs flown by O. Puhakka with 3/LeLv 26 from Kilpasilta. Note the aerial mast and the long carburettor intake. Fiat G.50, FA-25 (MM.3614), flown by Luutnantti (Lieutenant) Olli Puhakka, Commanding Officer of 3/LeLv 26, Suomen llmavoimat, Kilpasilta, October 1942. 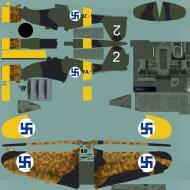 During major overhauls all aircraft were painted with standard Finnish camouflage scheme consisting in Black (musta) and Olive Green (olivinvirhea) bands with Light Blue (vaaleansinien) lower surfaces. The yellow spinner had a black band. 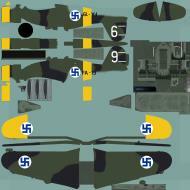 Outlines of four Soviet fighter claims were painted white on rudder. Lt Puhakka, having already led 3/LeLv 26 in March 1940, after a period spent as a flying instructor, was posted back to his old squadron resuming again its command on June 1942, and continuing to fly on Fiat fighters until 9 February 1943. 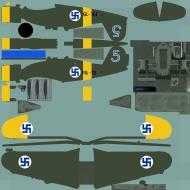 When later Puhakka became CO of the newly-formed Bf 109G equipped 3/LeLv 34, he had scored 13 aerial victories on G.50s. He was always regarded as the most skilled Finnish fighter pilot, claiming 42 victories before the war’s end. Fiat G.50 FA-6, 2nd series, serial M.M. 4727, 3/LeLv 26, Lake Ladoga air base, September 1941, piloted by kersantti (sergeant) O. Paronen (12,5 victories). This plane has been used in Finland since February 11, 1940. However it was flown during the Winter War, no victories were achieved. Photo: Kersantti T. Bergman posing for a photographer on the back of FA-6, belonging to 3rd flight of 26th squadron, Lunkula, September, 1941. 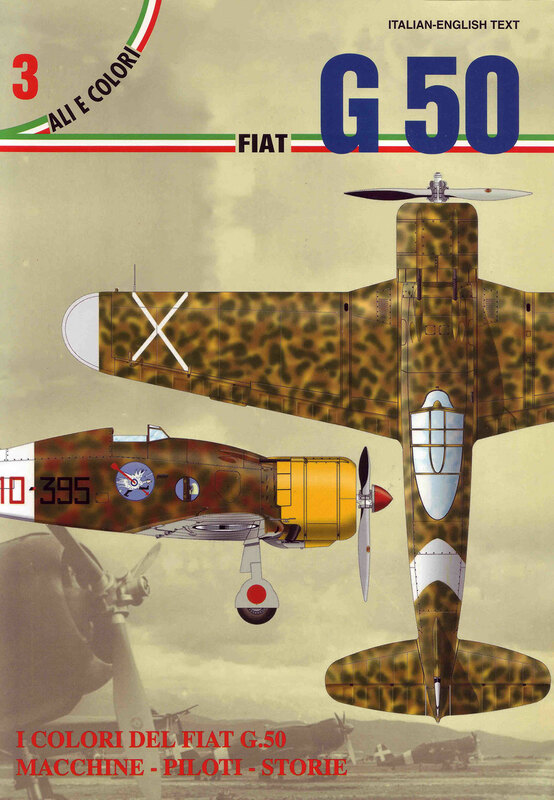 Fiat G.50. FA-26 (MM.4743). flown by Lentomestari i Warrant Officer) Oiva Oippa' Tuominen, 1.LeLv26. Suomen llmavoimat. Lunkula. August 1941. Ongmal Italian three-tone scheme with yellow tactical markings on lower wmgtips and fuselage band, as adopted on 25th June 1941 due to German regulations. The light blue tail code denoted a first squadron's aircraft (the second had yellow trimmed black codes and the third solid yellow ones). The lower profile is showing the same aircraft as appearing at Kilpasilta in October 1942. As Italian paints used to peel off quite easily a thin layer of Olive Green (Olivinvirhea) had been painted over, with traces of the original blotches still showing through. In the summer of 1942 first squadron replaced its light blue tail codes for plain white ones. Tuominen's detailed scoreboard at 22 October was also painted white on rudder. He was the top G.50 Finnish ace with 33 aerial victories, 13 of which claimed flying this plane. On 18th Aug 1941, for his twentieth claim, he became the first Air force pilot being awarded the Manneheim Cross, the highest Finnish award. Fiat G.50, SA-1 (MM.4738), flown by Kapteeni (Captain) Olavi Ehrnroot, commanding officer of Koelentue (Experimental Unit), Suomen llmavoimat, Tampere, January 1940. Three-tone scheme of Green and Brown blotches on Sand background with lower surfaces Light Grey. Note the national markings were not painted on the customary white underneath roundels. It was the first aircraft delivered to the Finnish Air Force on 18 December 1939 and assigned to the KoeL for evaluation. Initially, it was coded SA-1, later changed to FA-1 on 26.1.40, when the code of G.50 was changed to FA (for Fiat). Before being assigned to LentoLaivue 26 (No. 26 Air Wing) in February, this plane had been flown by the CO of the experimental unit, Captain Ehrnroot, to intercept several Soviet bombers, succeeding to shoot two of them down. It’s worthwhile noting that this aircraft, part of the second production series, was fitted with a fabric covered fin and an unbalanced type rudder, later retrospectively replaced on all Finnish planes. Fiat G.50, FA-25 (MM.3614), flown by Kersantti (Sergeant) P.Jurva of Lentosotakoulu (Fighter School), Suomen llmavoimat, Kauhava, October 1945. Standard Dark Green and Black camouflage, with Light Blue lower surfaces. Yellow tactical markings appear having been quite hastily removed. After having been always in force to 3/LeLv 26, Puhakka’s plane was posted to 1/LeLv 30 on 21.2.44 where it suffered an heavy landing on 24 February. After necessary repairs it was transferred to 3/T-LeLv 35 (No.35 Advanced Training Group) on 2 June and then to the Fighter School on 27 November, where it was definitively crash-landed by Sergeant Jurva, remaining injured on 18 October 1945. The traditional national insignia had been replaced by new blue-white-blue roundels when, further to a separate armistice with the Soviets on 4 September 1944, Finland had to fight the so-called Lapland War, in order to push all German troops still inside the country into Norway.